Heritage breed turkeys taste richer, but can dry out when cooked. Here is an easy and delicious marinade that delivers a flavorful, moist turkey breast without a lot of fuss. I am excited to see BN Ranch heritage breed turkey at the market, a real seasonal treat. The BN stands for Bill Niman (of Niman Ranch fame), and I’m lucky to be able to count Bill as a local resource for ethically raised meats. Heritage breed turkeys are so delicious, but have less fat. And of course, they are not pumped up with chemicals, flavorings or water. Did you know that some supermarket turkeys are cooled in bath of propolyene glycol? While it’s considered nontoxic, it’s also used to de-ice airplanes…no thanks. Let’s all stick to heritage breeds from local producers who aren’t using these kinds of industrial factory processes. I have picked up a breast piece, which is the trickiest to keep moist. Eschewing traditional methods, like rubbing it with herbs and wrapping it with bacon or loading it with butter, I decide to marinate it overnight in Indian curry spices, sheep’s milk yogurt and a small scoop of Bulgarian rose petals. I buy them in small amounts (they are expensive) and add them to my afternoon tea. But these ultra-fragrant rose petals, prized for their intoxicating perfume, work wonders in this marinade. You will feel like a Mughal princess (or prince!) when you enjoy the result. Wash and pat dry the turkey breast, season generously with salt all over. Season generously all over with Indian curry powder. 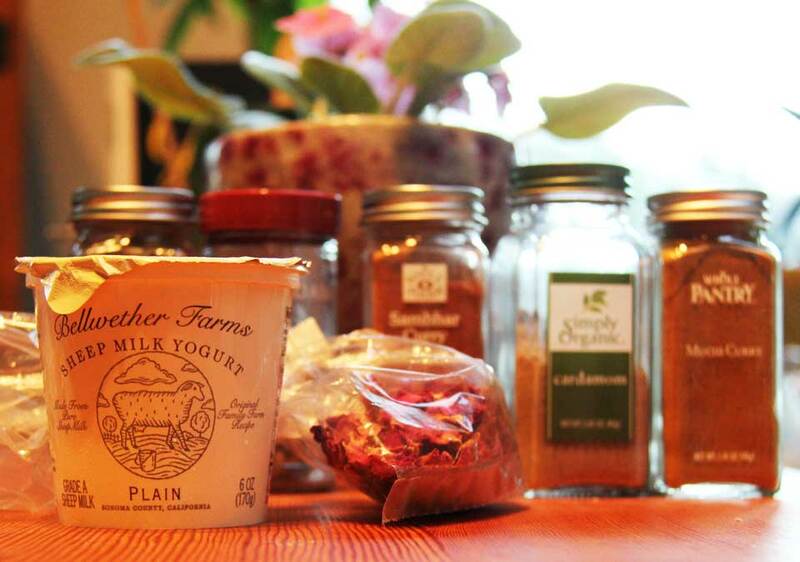 Place sheep’s milk yogurt in a bowl, add just a short dash of curry spice and ground fennel seed. Be generous with the other spices: cinnamon & cardamom. Mix well and add rose petals. Just stir to incorporate, but don’t mix too vigorously once you add the rose petals, as you don’t want them to break apart. Take a taste at this point. The yogurt marinade should be delicious, and taste kind of like Indian chai. It should be flavorful, but delicate and tangy, not sharp or bitter. Add turkey to this yogurt mixture and coat it all over. Place in a small container into which the breast just fits, add every last bit of yogurt marinade on the turkey, cover and refrigerate overnight, or up to two days. Remove turkey from the refrigerator and let stand for a half hour so that it’s not so cold. Place turkey in a cooking pot, skin side up. The pot should just fit it, you don’t want space around the sides of the turkey. Add a handful of raisins on top of the turkey, cover with a tight fitting lid and place in the oven. Turn temperature down to 325 F, and bake. I baked mine for 1 hour and 40 minutes. It will depend on how large your turkey breast is. Take the lid off, put pot back into the oven and turn on the broiler. The broiler will brown the top, and brown the raisins, too. After the top is a little browned, remove from oven and turn off the oven. Carefully remove the breast from the pan, letting the juices drain into the pan a while. Place turkey on a carving board and let it rest. Put pan on stovetop and turn heat on to simmer. Let the jus simmer until reduced. Some of you will want to enhance your jus, or thicken it. I just reduce mine by half or two thirds. Once the turkey has rested for ten minutes, carve it into slices. Serve with a little of the jus poured over. My jus ends up being quite potent, so just a little does the trick. If you have any turkey and jus left, put the turkey in a container, pour the jus over it, seal the lid and refrigerate. It’s even better the next day.